The 12 Best Gifts for Left-Handers: Find Gifts for Lefties of Every Age, Gender, and Range of Interests - Left-Handers are great people to give presents to - because there is a group of very useful tools that can make an enormous difference to them. We asked our 3000+ email subscribers to tell us what they thought were the Best Left-Handed Gifts, and used that information to create this list of the 12 Best Gifts for Left-Handers. Lefties are Great People....to give presents to. Everyday tools and utensils make very thoughtful gifts when they are configured for left-handed use. A handsome pair of left-handed scissors or an elegant pen designed for lefties, make a more personal and meaningful gift than the same item does for a right-hander, because righties do not have difficulty using most of the pens and scissors in the world. Lefties have very specific functional problems with the right-handed world they inhabit. Scissors don't work well, especially for cutting complex shapes. Pens and pencils smear, and the writer can't see what is being written because their left hand. Covers it up. Writing often hurts their hand after a while because pens and pencils have to be gripped tightly to push the point from left to right. Notebooks and portfolios open backwards, and the spiral coils on spiral notebooks cut into the left hand while writing. Left-handers also naturally orient towards the left – counter-clockwise. Clockwise rotation in clocks and watches feels backwards, and it's hard to turn the handle clockwise on can openers and corkscrews. Computer mice are designed backwards as well, shaped for right-handed operation even when plugged into the keyboard's left side. In sports, throwing, catching, and swinging are reversed, so baseball mitts and golf clubs for right-handers just don't work right. Left-handed adults have usually adapted to some degree, though they are often amazed when they discover how natural left-handed tools feel and work. But the lives of lefty kids can literally be transformed by a few simple tools like left-handed scissors, pencils, and rulers. Fine motor skills like cutting, writing, drawing, and measuring are integral to a child's intellectual and emotional development. Lefty kids often feel like failures at school, and are criticized for clumsiness. A gift of basic left-handed school supplies can help build confidence that will completely alter a child's feelings about school. Many left-handed adults tell stories of a childhood shaped by a negative self-image resulting from criticism and frustration. With a little help, years of self-doubt and unhappiness can be avoided, and lefty kids can begin to see the advantages of their difference from the right-handed norm. At leftyslefthanded.com, we asked over 3000 email subscribers to give us their opinion of the best left-handed gifts. Left-handed pens and scissors topped the list, then came left-handed notebooks, watches, and pencils. Left--handed computer mice, T-shirts, knives, peelers, can openers, and toothbrushes were also suggested. From this survey, and from our own 2-1/2 years of history, we've developed a list of the 12 Best Left-Handed Gifts. Many are sets combining 2 or more items from the survey. All are items lefties often buy for themselves and are thrilled to discover at our two stores. We invite you to examine the website, where we have over 300 possibilities for gifts. For those short on time, the twelve products listed below offer a range of gifts guaranteed to include something useful for lefties of every age, gender, and range of interests. Essential Tools for Lefties Under 10: 2 pair left-handed kids scissors (blunt and sharp), left-handed graph paper notebook for learning to write, 3 different types of pencils including the Yoropencil which adjusts for a left-handed grip, left-handed ruler, and a pencil sharpener which rotates counter-clockwise. 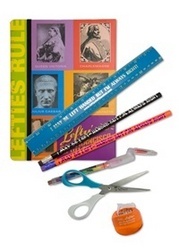 Essential Tools for Lefties Over 10: A left-handed journal with photos of famous lefty rulers on the cover, a set of left-handed student scissors, left-handed pencils including the Yoropencil which adjusts for a left-handed grip, a left-handed ruler and pencil sharpener. Left-Handed Kids’ Yoropencil Set: One of our most loved products. Lefties re-order the leads again and again. Two child-sized lead pencils in the award-winning Yoropen design with the adjustable left-handed grip, and a colored Yoropen crayon set. Embossed Left-Handed Portfolio: Handsome Soft-Touch Left-Handed Portfolio embossed with lefty's logo. Comes with a pad of paper and lefty's notepad, and a black Yoropen. See also our Beautiful Embossed Leather Portfolio for a more luxurious gift. Left-Handed Household Tools Set: An extremely thoughtful and useful gift for a left-handed household. Includes the very popular left-handed tape measure, soft-grip scissors, flat ruler, tailor's tape, and the wonderful left-handed Yoropen. "I May Be Left-Handed, But I'm Always Right" Gift Set: Our most popular items printed with our most popular lefty slogan! Includes a T-shirt and mouse pad with the Golden Gate Bridge, left-handed note pad, ruler, pencils, Yoropen, and the left-handed dribble mug which only works for lefties. 5 Pairs of Left-Handed Scissors: Scissors of several types so you can have the right ones in every room! Be prepared for projects and package opening! Lefty Writers Gift Set: Includes 2 of both the ergonomic left-handed Yoropens and the fast-drying Jetstream pens, a Lefty's famous names spiral notebook, two Lefty's pencils with a sharpener, and the "I May Be Left-Handed, but I'm Always Right" dribble mug (which only works for lefties). Parents and Teachers of a Left-Handed Under 10: 2 pair of left-handed kids' scissors (blunt and sharp) along with a pair of training scissors with grips for adults and kids, a wide-ruled left-handed notebook, Lefty's reverse reading logo pencils and a left-handed sharpener, and the Stabilo pen which is especially designed to teach kids to write. Deluxe Left-Handed Kitchen Set: Includes left-handed crab claw kitchen mitt, kitchen shears, can opener, colorful swivel peeler, and two bamboo cooking tools. Deluxe Left-Handed Garden Gift Set: Includes the Lifetime Warranted Left-Handed Felco Pruner, Clauss Florist Shear, a spiral notebook for planting notes, and a Yoropen. Executive Yoropen: The deluxe metal version of the most ergonomic left-handed pen ever made, in an elegant metal case.